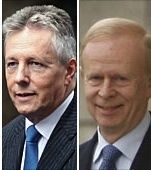 The fate of recent unionist leaders has not been happy. For many years unionists were led by people firmly rooted in the lands their forebears had taken over by armed struggle following invasion. In time this leadership was broken into by merchants, Mr Andrews and Mr Faulkner, and this was the beginning of a gradual unionist change from completely undemocratic politics into partly recognising democratic politics, and then into making an accommodation with democratic politics. For the unionist community it has been a painful and often frightening progression. In the twilight of the gods, the leadership of Brooke, O’Neill, Chichester-Clarke came more and more under attack and when Mr Faulkner, a talented manufacturer of excellent shirts, became prime minister the landed gentry could not hold on to open leadership of British unionism in Ireland any longer. From then on, as the interest in, and commitment to, unionism by landed gentry, aristocracy and big business in Britain weakened, the ever more rapid arrival and disappearance of unionist leaders underlined the increasing loneliness of the unionists’ situation. One by one political leaders fell under a Paisley onslaught which said, O’Neill must go, Clarke must go, Faulkner must go, Trimble must go, and then we were astonished to see a departing unionist leader, who was far from being Paisley, Sir Reg Empey, saying another unionist leader, Mr Robinson, should, as we politely say of leaders now, “consider his position”. The disintegration of British union supporters in Ireland has come not from their opponents outside but from their friends inside. Their opponents, then, do not have the disagreeable task of demolishing unionism but the agreeable task of strengthening themselves. As the voting strength of their opponents gets stronger, the unionists fragment as people often do when they believe they are losing. When you are facing victory, you may be joined by others of the same mind, when facing defeat you may well fragment. Unionist strength is divided between those who insist that the old methods of voting control and population control and strong laws for both will win and those who know that new alliances and new policies have to be made but are afraid to make them because now their friends seem more threatening than their opponents. We arrive at the strange situation where it is the nationalists and republicans who are making realistic offers of a better deal to unionists while their friends within are saying, no, the policies which failed in the past will succeed in the future - without explaining why they should. In the past the London government was available to help carry out the policies of controlling votes and people, but is no longer offering such help with much enthusiasm, so while republicans and nationalists are looking forward to the challenge of a political future without London-based taxation, unionists are afraid even to look at the challenge of Irish politics which they have never understood and always feared. Getting rid of leaders, does that make real change? New leaders with new policies, yes, if they have the courage and good sense to make their systems work for the good of the whole people. New leaders with the old advisers can be as stagnant as old leaders with new ones.